Spray Stop Standard and Spray Stop 50+ anti-splash tape is used for applications in the marine & offshore industry. This high-tech laminated multilayer aluminium tape, has been designed by safety specialists in order to prevent spray outs of hazardous liquids (oil / fuel) from tubing systems. These liquids can cause extremely dangerous situations like fires, explosions or other dangerous situations. According to the SOLAS amendment chapter 2-2 regulation, ships are to apply appropriate protection system to prevent leakage and splashing of flammable oil from FO, LO hydraulic and other piping systems. This product complies with the IMO A653 (6) regulations. Spray Stop standard can be used up to 15 bar pressure, Spray Stop 50+ up to 50 bar pressure. Click here to oversee all Spray Stop certificates and datasheets. T-ISS retro reflective tape is used for reflectorizing SOLAS life support equipment such as life vests, jackets, and rafts. T-ISS SolasFlex is an encapsulated lens type sheeting with a flexible and highly transparent plastic film. 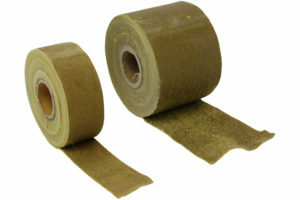 Our tape has been specially designed for the marine and offshore industry. It ensures long durabllity, high brightness and anti-delamination. All products are comprised of an encapsulated lens optical design that provides high reflectivity over a wide range of entrance angles, whether dry or wet. All products are silver in color under daytime viewing conditions and reflect a bright white. Click here to oversee all SOLAS Reflective Tape certificates and datasheets. It conforms to IMO Res. A658(16) and meets USCG specification 46 CFR Part 164. it is approved wheelmark, USCG, RR and KR. T-ISS SolasFlex is type 2 approved, this means in can be used indoor as well as outdoor and is suitable for all applications. 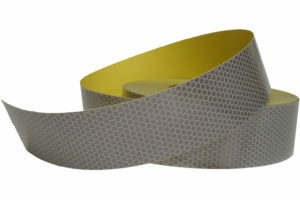 SolasFlex is a Type 2 solasgrade tape for continious outdoor exposure. Please note: Reflective tape with a type 1 approval can only be used on stored lifejackets and life rafts. This means the tape is not suitable for buoys, lifeboats and other life saving equipment which is exposed to the outdoor environment. normal salt or fresh water. This repair product sets even under water and because of this, it is ideal to use in difficult / wet applications. T-ISS PipeRep can be used for corrosion prevention, reinforcement and electrical protection up to 16,000 volts. PipeRep will retain pressure up to 50bar on supply lines and will function under intermittent temperatures up to 250 degrees Celsius. T-ISS PipeRep is uniquely coloured orange for easy identification of repair zones. Click here to oversee all Pipe Repair Tape certificates and datasheets. 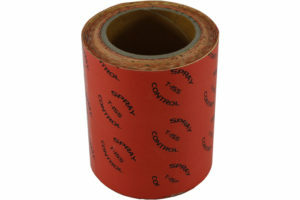 Spray Control protection tape is made of triple layer reinforced Vinyl. The UV stabilized colored material is resistant to sun, rain, and fumes. The material is excellent resistant to most chemicals and to temperatures up to approx. 75 Celsius. In the overview on last page in this catalogue you can view if the Spray Control tape can be used on your equipment & piping systems. As an operator of processinstallations it is stipulated by Law that you have to make sure your factory is a safe environment. Click here to oversee all Spray Control Tape certificates and datasheets. 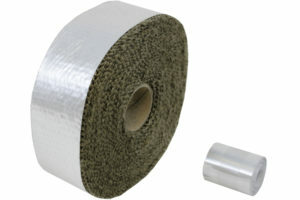 T-ISS foam mounting tapes are closed-cell, polyethylene foam, coated with a high tack / high shear acrylic adhesive. They have superior chemical and fuel resistance, and good outdoor weatherability. They also give excellent adhesive performance in the area of tack, sheer and adhesion. High tack permanent adhesive with excellent ageing and weather resistant properties specifically designed for mounting and joining nameplates, plastic trim, signs and emblems. Long term bonding performance to plastic hangers and mirror mounting. Used on board of cruiseliners, tankers, ferries, etc. to install signage or to fix products to a flat surface. Click here to oversee all Foam Tape certificates and datasheets. Extreme weather conditions can cause leakage of your hatch covers, which will lead to the damage of cargo being transported. 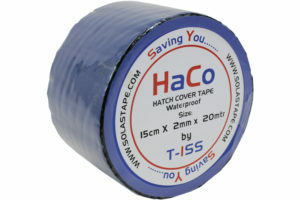 T-ISS HaCo Blueliner tape keeps moisture out, and ensures a weather and fume tight hatch seal. HaCo Blueliner tape is design by specialists with 20 years of tape experience, to seal out the elements on hatch cover rims. HaCo Blueliner tape has an extraordinary strength, adhesion and is extremely flexible. It can be easily recognized by it’s blue top layer of modified PE material. A material which gives the highest protection under extreme conditions. Regulations regarding hatch covers have evolved since the investigation following the loss of the MV Derbyshire. The Association of Classification Societies increased this strength standard by creating its Unified Requirement § 21 in 1998. Click here to oversee all Hatch Cover Tape certificates and datasheets. All HaCo Blueliner tape is tested under practical environment and extreme standards. HaCo Blueliner tape can be installed between -45 and 40 °C, and can withstand -15 to 70 °C. Rolls are 20 meter of self-adhesive SBS bitumen rubber compound, coated to a modified blue PE liner and with a release PE Liner. Shelf life is 24 months when properly stored. 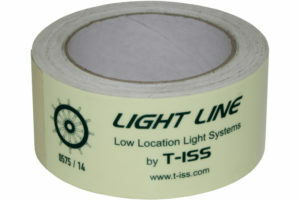 T-ISS manufactures various glow-in-the-dark photoluminescent tapes. These tapes are being made using PVC, PU and PET materials. These are applied in various ways so that the tapes can be used both in- and outdoor, and are weather-resistant. PU material is used for applications with rounded surfaces and locations where heavy duty materials are required. Click here to oversee all Photoluminescent Tape certificates and datasheets. CorStop Zinc tape will prevent galvanic corrosion and protects new and existing steel parts such as bridge supports, pipelines and other marine structures. CorStop is made of a high purity zinc with an high tack self adhesive backing. 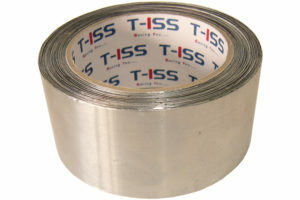 CorStop zinc tape is being supplied in 25, 50 and 100 wide rolls each 20 meter long. Click here to oversee all CorStop Zinc Tape certificates and datasheets. Simple to use. 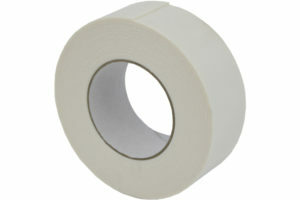 Drip Stop Tape is not using any adhesive components and it will not stick to the hand. 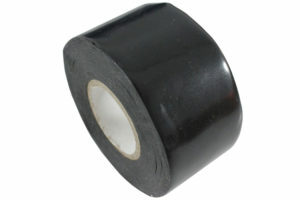 Drip Stop Tape is made to stick on its own components, when applying it therefore needs an overlap of half the width. The full cure time is approximately 20 – 30 minutes. Drip Stop can be used even on wet surfaces and pressurized leaking piping up to maximum 3 kg/cm2. It will even cure under water. When being used in wet areas, it must be winded very tightly. Drip Stop can also be used as a protection layer to prevent corrosion, or as electric insulation. Click here to oversee all Drip Stop Tape certificates and datasheets. 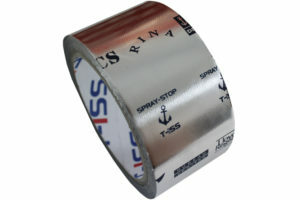 T-ISS RustStop is a corrosion protection tape. This tape makes sure that all kinds of steel structures will be protected against corrosion. 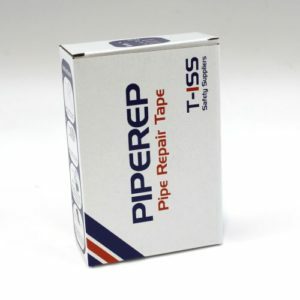 The tape provides an excellent resistance to water, acids, alkalies and salts. It is a appropiate long-term solution against corrosion. The tape is solvent free and creates a robust barrier against water. It protects metal surfaces underwater, underground and in the most demanding outdoor conditions. The tape won’t peel, harden or crack. It is very easy to apply and retains its quality under extreme conditions. Click here to oversee all Rust Stop Tape certificates and datasheets. 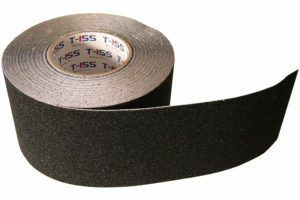 T-ISS SlipStop tape helps to protect slippery surfaces, to prevent accidents. Slip Stop offers safe working and walking by when applied on stairs and walkways, both indoor and outdoor. SlipStop is a mineral coated plastic film with a pressure sensitive adhesive, protected by a removable liner. Click here to oversee all Slip Stop Tape certificates and datasheets.